What do I like better: The pattern of her bag or the pattern of her coat? Both beautiful. Great combination! 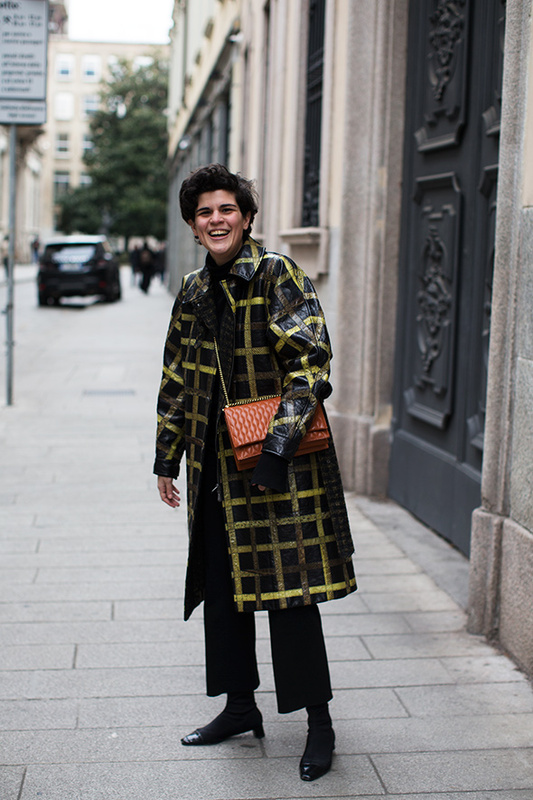 The bag is very nice, but the statement coat is genius. I think we have seen this lady before in a black and white Pic and she gave out those great happy vibes. This outfit I would wear at an instant, I love the trench. The fabulous handbag sets the whole look off…this stunning lady brings such style to an otherwise grey city…bravissima! Beautiful! Wonderful proportions but most importantly, radiant smile! Bravo! A quite extravagant look. I love the brown leather handbag.